John Archer finds innovation alive and well in Panasonic’s latest high-end LCD TV. Read our PANASONIC TX-65EX750 Review. LCD TVs have a problem, OLED models are stealing their thunder when it comes to black levels, and with HDR entering the frame (literally) it’s become more and more obvious. The technology uses external lights to illuminate pixels, meaning that during dark scenes, viewers are often faced with haloes around bright objects, stray bars of light or swathes of greyed- out image. It can put a real dampener on movie night. Panasonic’s TX-65EX750 aims to tackle this problem head on. The TV brand has a proud tradition of innovating in the LCD backlight space, and the 65EX750 continues that theme with a feature described as ‘digitally enhanced local dimming’. The ‘digitally enhanced’ part uses a new shuttering system to angle its liquid crystals, so that they can receive more or less light as per the demands of the picture. The local dimming part, more traditionally, enables different segments of the TV’s edge-mounted LEDs to output different levels of light. Let’s hope it works. This is a 4K TV (natch), with smart features coming courtesy of Panasonic’s attractive, easy to use Home Screen 2.0 platform. Apps include the 4K and HDR versions of Amazon and Netflix, as well as the UK’s key terrestrial channel catch-up services via built-in Freeview Play. It’s quite a good looker, with neat, slim silver bezel, and is supplied with a gleaming stand that allows the chassis to swivel to target different viewing positions. Smaller EX750 models add a ‘lift’ function, letting you raise the screen’s height. There are the usual connections: four HDMIs, a trio of USBs (with associated recording function), and Wi-Fi/LAN network options. Last year’s DX750 range only featured two HDCP 2.2-capable HDMI inputs. Thankfully, such support is now offered across the board, although I found that only HDMIs 1 and 2 support 4:4:4 colour. As you’d expect with a relatively premium LCD TV in 2017, the 65EX750 caters for HDR and HLG high dynamic range formats. It should also gain support for Samsung’s open- standard dynamic metadata HDR10+ system via a future firmware update. The TV isn’t especially bright by HDR TV standards, though. I could only get around 500 nits out of it when using a 10 per cent white HDR window. That’s barely a third of the peak brightness you can get from Sony’s XE9305 TVs for instance, and is even 200 nits less than Panasonic’s OLEDs. On the upside, the Panasonic can maintain that 500 nits for a protracted time versus rival screens; handy when watching consistently bright HDR content such as Planet Earth II. The relatively low peak luminance likely helps the set’s digitally enhanced local dimming technology do a superb job of limiting unwanted backlight artefacts. Even with extremely bright objects against near-black backdrops, such as the lights of Iron Man’s suit when he talks to Peter Parker after rescuing him in the Spider-Man: Homecoming 4K Blu-ray, there’s scarcely a trace of the light blooms or bands around the bright areas that you might have feared. The level of precision isn’t the same as you’ll witness with OLED technology. Nor is there that almost luminous dynamism you get from OLED’s ability to put a peak white pixel right next to a pitch black one with no compromise across the two. But the 65EX750 is much cheaper than any 65in OLED, and by LCD standards its light management during dark scenes is first-rate. This is far from the 65EX750’s only area of picture strength. Its colours, for instance, are for the most part excellent. 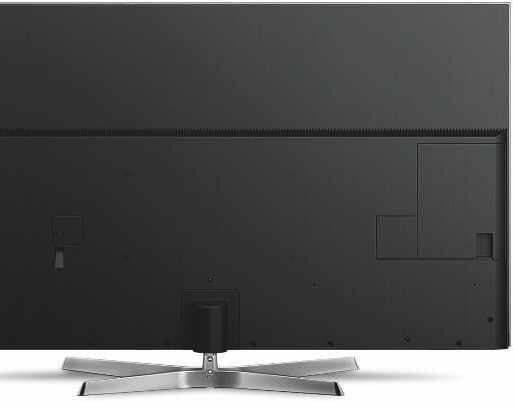 It deploys the same new-for-2017 Studio Master HCX2 processing system found on Panasonic’s outstanding 2017 OLED TVs, and uses the advanced, semi-professional ‘3D Look Up Table’ approach to rendering colours. As a result Spider-Man’s suit showcases subtle variances in red, and skin tones look natural. There’s more fine colour detail in backgrounds of Homecoming’s shots across New York, too, and there’s some really strong management of low-lit colours in dark scenes. Worries that the 65EX750’s relatively low brightness might lead to excessively muted wide colour gamut effects and detail crushing in dark areas amount to zilch. Not surprisingly, this flatscreen’s finessed colour reproduction leads into a crisp, detailed performance with 4K images. While …Homecoming isn’t the hands-down sharpest 4K title I’ve seen (we’ll have a full review next issue), some sequences – particularly those in Vulture’s lab – really ram the 4K pixel-push home. And the 65EX750 confidently extracts every last drop of info, be it the lines on Michael Keaton’s face, or the minute textures of all the alien tech that’s lying around. upscaler of HD sources, adding tangible pixel depth and clarity to HD images without creating exaggerated edges or grain. this includes the sun setting behind the bridge while Spider-Man sits on a balcony with a view of New York City behind him. Having said that, the 65EX750 does a better job of ‘remapping’ peak luminance detailing to its screen’s capabilities than some brighter rivals – more evidence of the strength of the Studio Master HCX2 platform. The other thing that can cost this set a little 4K sharpness is motion. With its motion processing system turned off, objects can look slightly more juddery than they ideally would. Yet if you use Panasonic’s Intelligent Frame Creation processing to reduce the judder, it can cause a few unwanted side effects, such as slight shimmering around Spidey as he sprints and swings through a row of suburban gardens, fences and hedges. The difficulties finding a motion handling ‘sweet spot’ among the 65EX750’s settings also apply to its handling of contrast. If you set the TV’s Adaptive Dimming setting on its maximum level, you get really strong black levels and minimal backlight clouding – but peak brightness is reduced to around 400 nits. Reducing the Adaptive Dimming to Medium gets you to 500 nits, but dark areas look much greyer. Perhaps the single strangest quirk of the 65EX750’s pictures is the way they only really look good if you use the set’s Dynamic picture preset. With all other Panasonic TVs you generally get the best results with the company’s Cinema or True Cinema settings, but all the 65EX750’s non-Dynamic presets suffer with an aggravating problem: inconsistent colours. Tones on the left and right side of the screen often seem to be infused with a subtle yellow undertone. This is particularly apparent with the screen-filling rich red of the Marvel Studios logo, as a good few inches of the left and right sides of the image lose some of their red lustre. But you can also see the problem in more typical video content. It’s all pretty odd, and suggests that something about Panasonic’s digitally enhanced local dimming system needs to be driven hard to deliver its best results. Audio quality is a disappointment. Bass is too thin to sound convincing with your typical movie, and the mid-range is surprisingly weak too, sometimes leaving dialogue sounding artificial and dislocated from the pictures. In an ideal world, I’d be able to wrap up this review by testing the 65EX750’s 3D playback – a feature supported by practically no other TV this year. Tragically, if tellingly, Panasonic couldn’t find a single pair of the active shutter 3D glasses I’d have needed to test its 3D capabilities. Sigh. Now available for around, this 4K player (with Wi-Fi streaming talents) represents an affordable upgrade to the world of UHD Blu-ray. The small scale chassis makes it easy to accommodate, too. Although it's certainly not perfect and needs careful setup, the new backlight system is a revelation, and 3D playback will find this set fans.